Fine wines do not necessarily mean high prices. Our Company aims to source and provide fine and rare wines to different sets of consumers – individuals, corporates and restaurants at reasonable prices. We pride ourselves in providing these quality wines at very competitive prices. We will also be able to source for that aged, rare and elusive bottle for your special occasions, be it a Chateau Lafite 1959, a La Tache 1971 or a Chateau Palmer 1961. We source for our wines from reputable merchants across Europe, with a specific reference to UK/Switzerland/Belgium/France, where we have had a long working relationship with them. Some come from our precious own collection built up over the years. Provenance is the most important factor in wines, and besides wines being purchased ex-chateau, there is always a risk in purchasing aged, rare wines. Stringent checks and analysis is done before purchasing is complete. We conduct regular wine tastings and dinners, and therefore we are able to recommend as well as to provide consultancy and advice if you are looking for that special bottle. We have advised our customers on cellar construction as well as a development of a wine portfolio for investment purposes. Our company has also recently developed a Consignment model specially for our restaurant and hotel clients. This enables these establishments to actually “mirror” a certain percentile of our extensive winelist, which they will in turn offer to their customers. Please contact us for more details. 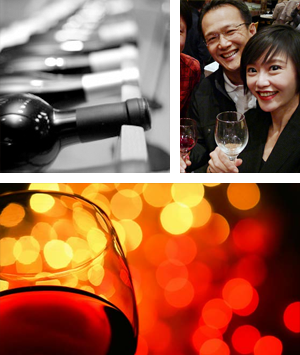 Guaranteed the best value and best quality Vintage Fine Wines you can find in Singapore!